The Overfalls Foundation was built on the time and effort put forth by many dedicated member volunteers. Now our members are getting older and busier every year. We need to encourage new membership, especially younger folks to keep our organization active for years to come...Read the entire message by clicking here. • Thar She Goes !!! 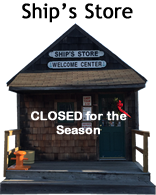 The Ship has been towed to the Dorchester Shipyard (click for information) for routine maintenance on Wednesday November 29, 2017. Photos of the Ship leaving its slip and traveling the canal can be viewed here. The Cape Gazette article can be read by clicking here. See YouTube videos of the trip below. Photos showing Overfalls entering the dry dock and undergoing maintenance can be seen here. 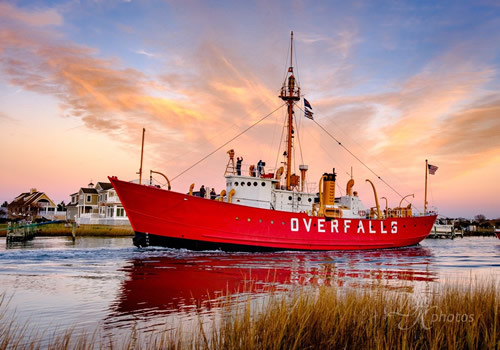 Check out YouTube posted videos of the Overfalls Lightship as created by friends of Overfalls and local news organizations. The Delaware Museum Association highlights the restoration work done by the Overfalls' Dirty Hands Gang. to read their website article. If the sound does not immediately come on place your mouse on the viddeo screen and click on the “speaker” symbol in the lower right hand corner.